On my top shelf of storytellers sits Bob Dylan. His songs written and/or performed over the last 50 year have appeared in movies or Tv shows more than a staggering 550 times. Along with his creative influence he’s won many awards including an Oscar for his Things Have Changed which he performed on the movie Wonder Boys (2000). Many great movie characters seek shelter from the storm; Rocky, Terry Malloy (On the Waterfront),Norma Desmond (Sunset Blvd.) , Rick (Casablanca), Erin Brockovich, George Bailey (It’s a Wonderful Life), Tom Joad (The Grapes of Wrath), Norma Rae, Oskar Schindler, Maximus (Gladiator), Karen Silkwood, Tyler Durban (Fight Club), Indiana Jones, Ellen Ripley (Aliens), Chuck Noland (Cast Away), Joan of Arc, Sophie (Sophie’s Choice), C.C. Baxter (The Apartment), Andy Dufresne (The Shawshank Redemption), Butch Cassidy & the Sundance Kid, and Bogart and Hepburn’s characters in The African Queen. If you’re looking for a standard and proven theme/desire to hang your story on take a tip from Dylan and write about characters who are seeking shelter from the storm. It emotionally resonates with movie audiences —people who are also seeking shelter from the storm. P.S. Couldn’t find a good version of Dylan singing Shelter From The Storm, but I did find a version with Rodney Crowell and Emmylou Harris. Let me start with the good news—and then I’ll get to my car wreck. Yesterday Red Shark News posted Seven Must Read Blogs for Screenwriters and Screenwriting from Iowa…and Other Unlikely Places was the first blog mentioned. That nudge at the end of August helped this blog have its most viewed month in a year and a half. Welcome to the new readers, and I appreciate the shout-out by Patrick Jong Taylor. If you want to read one post that sums up what I’m after here check out; The Secret to Being a Successful Screenwriter (Seriously). No snake oil being sold there. Free advice that follows where Oscar-winning screenwriter Michael Arndt (Toy Story 3) says 99% of your efforts should go to becoming a better screenwriter. My Labor Day weekend started with a bang. While stopped at red light, the above car slammed into the back of my vehicle going between 30-40 mph. Thankfully I was driving a full-sized SUV that appears to have suffered only a mangled bumper. Though I had some pain in my back and neck I was able to drive home from the accident. The next day x-rays showed there appears to be a hairline fracture in my neck. I was given a couple prescriptions for pain killers and muscle relaxers, and supposed to see a specialist tomorrow. I’m sure many readers have been in worse accidents. 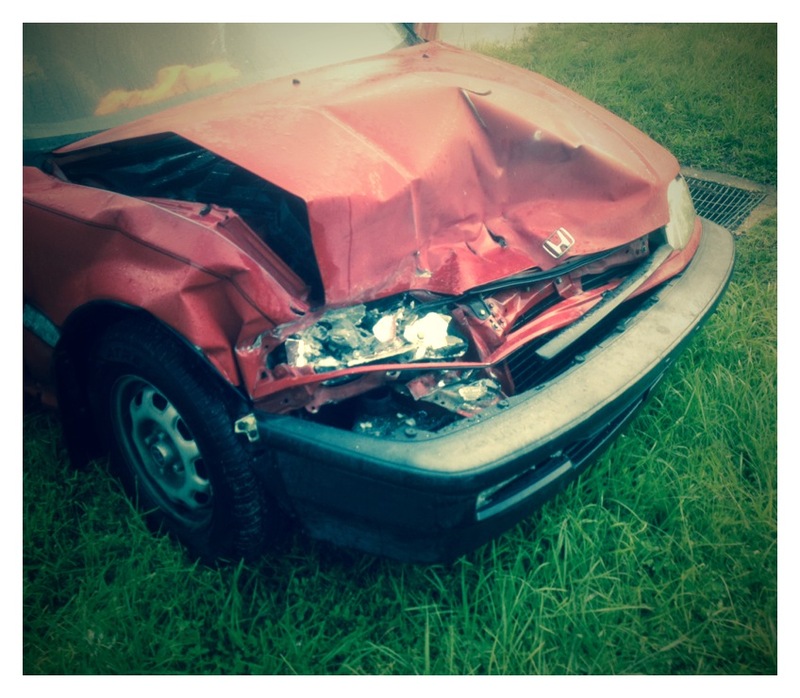 Car wrecks where some involved didn’t walk away— or if they did had to use a cain or a wheelchair. I haven’t been in an accident in over 25 years, and while thankful it wasn’t worse it still shakes you up. You’re suddenly more sensitive to the tail-gaters, and how many small cars are on the road. I don’t see buying (or even renting) a compact car in my near future. 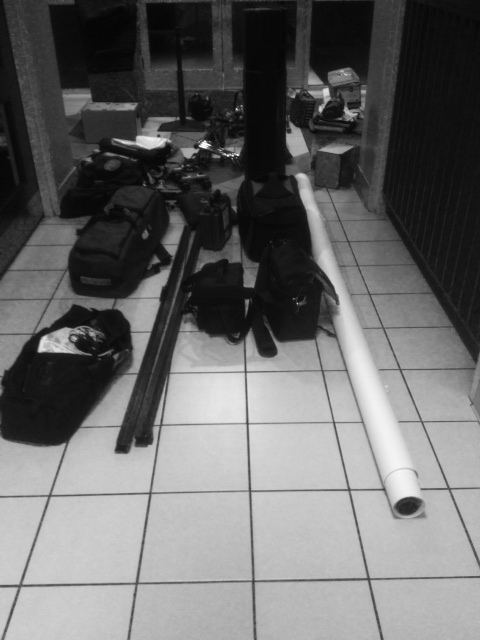 Last week I did a solo video shoot that wrapped late at night so I lined up all my gear at the door so I could back my SUV up and load everything at once. It was such a ridiculous amount of gear that I stopped and took a picture. And I don’t think my 72 pound Arri IV light kit is even in this shot. I’ll see what the specialist says tomorrow about my neck, but thankfully I’m in post production this week so no heavy lifting scheduled. All that to say, have a happy Labor Day—and drive safely. P.S. Just to keep it movie related; car crashes are such a major part of American movies because cars are such a integral part of American culture and they also fit the bill for conflict on many levels. The car crash scene I thought about after my accident was the one in Sweet Dreams (1985) written by Robert Getchell and starring Jessica Lange as county singer Patsy Cline. Here’s the trailer from Crash (2004) which is full of horrible things happening. BTW–Horrible things=conflict. Followed by a well written, acted and directed scene from Crash. Here’s everything I learned in film school (and in screenwriting workshops and books)…boiled down to one word. But before I get to that one word let me say that I went to film school so long ago that Orson Welles was in my class. Okay, not that long ago, but back when film schools only used film. Before everyone wanted to be a film director young people just wanted to be rock stars. I knew nobody who had any connection to the film industry when I decided to go to film school. I mention all of this because the one word I’m going to tell you is so basic. But it is the single most important thing I learned in film school. It may not be a revelation to you, but it’s important nonetheless. The most important thing I learned in film school was the importance of (here it comes) conflict. Not just any conflict, but meaningful conflict. A few years ago I went to a writing workshop with Alfred Uhry, the writer of Driving Miss Daisy. I believe he’s the only writer to win an Oscar, an Emmy, and a Tony award. I thought that it was sure to be a wealth of writing information. This was when I lived in Orlando (Anyone remember Hollywood East?) when a theater group was performing Driving Miss Daisy that he was coming to see and agreed to do a master class on writing. One of the first things he said was something to the effect of — I’m not sure why I’m here. I’m not sure why they asked me to speak on writing. I’m not sure there are any rules to follow. This is what I paid money to hear? He agreed conflict was important and he began to talk and we were off to the races. He didn’t have a prepackaged seminar, but it was a wonderful day of hearing his antidotes and experiences in the film business. He said something that has stuck with me all these years and that I think would be helpful for all writers to hear. It was about his expectations after writing Driving Miss Daisy. He had little expectations. He was in early fifties and he just wrote the 62 page play as a tribute to his grandmother. That’s all. He wasn’t trying to change the world. He wasn’t trying to get rich and famous. He wasn’t trying to write the great American screenplay and win an Academy Award. His starting place was small–almost obscure. When he found out it would have a six-week run at a theater in New York so far off-Broadway that you had to walk up three flights of stairs to see the play, he was thrilled. He was glad it would have a long enough run that all his relatives could see the play. Uhry didn’t know that his story of an elderly Jewish woman and her black driver would strike a chord like it did. (It certainly wasn’t a high concept story.) But the play became a Broadway hit and then it was off to Hollywood. To borrow the words of Jimmy Buffett, Uhry “captured the magic.” May we all be fortunate enough in our life to have that experience one time. Driving Miss Daisy was Uhry’s equivalent of Don McClean’s song American Pie. It’s become a part of the fabric of our culture. Uhry captured the magic with a story that was small in Hollywood terms, but one full of conflict as well as meaning. From the opening scene when she had an accident while backing her car out…until Miss Daisy died it is a story full of meaningful conflict. What are your favorite movies scenes? Good chance they’re full of meaningful conflict. “Of all the gin joints in all the towns in all the world, she walks into mine.” “I am big. It’s the pictures that got small (Sunset Boulevard). “She’s my sister and my daughter.” (Chinatown)—Conflict, Conflict, Conflict. Look AFI’s list of heroes and villains. All full of conflict. So there you have everything I learned in film school boiled down into one word — conflict. Now all you have to do is sit down and write a story full of meaningful conflict. That’s the hard part. In every scene you write there should be some level of conflict. It could be rising conflict (the calm before the storm) or resolution afterwards. But conflict is at the core of your story. Conflict with self, conflict with society, conflict friends and family, conflict with nature…but have conflict with something. Meaningful conflict usually is conflict on at least two levels. The town has conflict with the shark eating people, and an economic conflict if tourist are kept away which leads to conflict in society with leads to conflict within the family. And to top it off the sheriff has his own conflict because he is afraid of the water. Jaws was not just a run-of-the-mill special effects movie. In fact, the special effects weren’t all that special. The reason conflict is such a powerful piece of filmmaking is because we can relate to that in our own lives. Mike Tyson said that, “Everyone has a plan, until they are punched in the face.” Country music singer Deana Carter has a song titled, “Did I shave my legs for this?” We can relate to conflict. Every day we have to deal with conflict on many levels. It’s part of living east of Eden. Driving Miss Daisy wasn’t written in Iowa, but it takes place far from Hollywood in a small town in Georgia. And that’s at the heart of Screenwriting from Iowa. The state of Georgia is no stranger to conflict. (I’m not just talking about the Civil War or the Florida Gator’s football team.) Read the sermons from Ebenezer Baptist church by its former pastor Dr. Martin Luther King. And think of these songs and stories rooted in Georgia history. Any short story by Flannery O’Connor. Write stories about where you live. And like Alfred Uhry don’t set out to write the great American screenplay. Just write screenplays full of meaningful conflict.